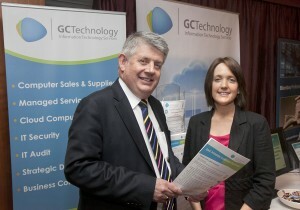 GC Technology sponsored a stand at the CPA Ireland Tax conference on Thursday 29th March 2012. Over 250 CPA Accountants were in attendence. Picture shows John Coffey, Managing Director of GC Technology discussing the services of GC Technology with Jennifer Brennan CPA Ireland.